NAIROBI, Kenya (AP) — An upscale hotel complex in Kenya’s capital came under attack on Tuesday, with a blast and heavy gunfire. Witnesses and police at the scene called it the latest terror attack in a country that has seen several deadly ones in recent years. The al-Shabab extremist group based in neighboring Somalia claimed responsibility and said its members were still fighting inside. The complex in Nairobi’s Westlands neighborhood includes a large hotel known as DusitD2, banks and offices. Several vehicles burned. People were being rushed, even carried, from the scene. One was on a stretcher. “It is terrible. What I have seen is terrible. I have seen a human as I ran out and there is what looks like minced meat all over,” said one a man who said he ran from the scene, Charles Njenga. He did not give details. Gunfire continued several minutes after the first reports. Black smoke rose from the scene. A bomb disposal unit was on the scene and vehicles were being cordoned off for fear that they contained explosives. An unexploded grenade was seen in a hallway of the complex. 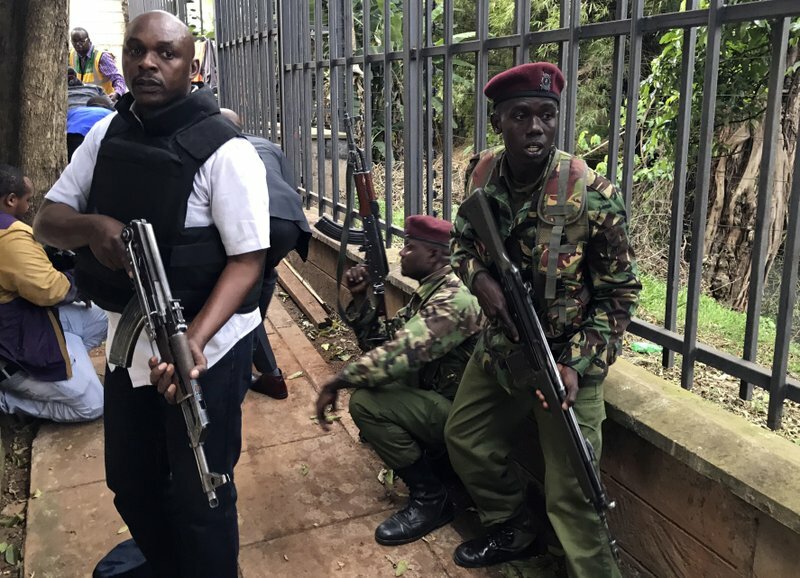 “We have sent officers to the scene, including from the anti-terrorism unit, but so far we have no more information,” police spokesman Charles Owino said. Ambulances, security forces and firefighters rushed to the scene, sirens wailing. A large group of women were hurried out by security forces, one woman still in hair curlers. Other groups of dozens of people were hurried away as plainclothes officers went shop to shop in the complex. Some held up their hands to show they were unarmed. What appeared to be plainclothes security forces inched their way toward the scene, guns in hand. Helicopters could be heard. Other people appeared to be taking cover behind fountains and other features in the lush outdoor complex. The attack immediately reminded many Kenyans of the Westgate Mall attack in Nairobi in 2013, when al-Shabab extremists burst into the luxury shopping center, hurling grenades and starting a days-long siege that left 67 people dead. The complex under attack is less than 2 kilometers from Westgate Mall and is in what is considered one of the most secure areas of the city. The attack came three years to the day after al-Shabab extremists attacked a Kenyan military base in Somalia, killing scores of people. The al-Qaida-linked al-Shabab objects to the presence of Kenyan troops in the turbulent Horn of Africa nation.